Don’t you just love pomegranate seeds? I reckon you could scatter a handful on practically any old dish and it would be transformed into something quite magical. Or is that just me? It’s clear to see why the beautiful pomegranate is one of the possible contenders for the forbidden fruit in the Garden of Eden. I’d have been tempted. 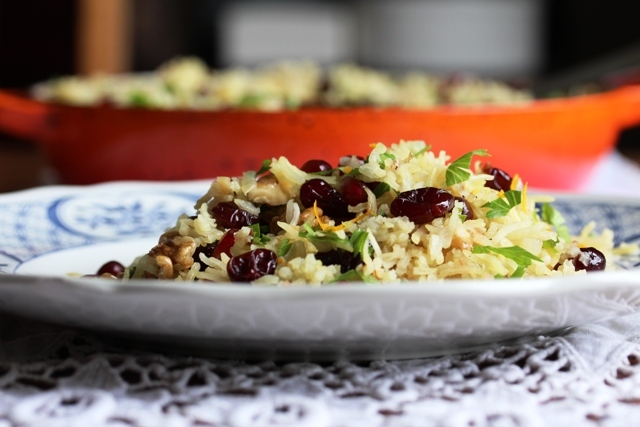 This Persian jewelled rice however is as far removed from just any old dish as you can get. It’s a wonderfully light and fragrant taste of the Middle East, incredibly easy to prepare and looks a million dollars. Or should that be rial? It’s typical, isn’t it? I finally get around to posting a summer barbecue recipe and all of a sudden the gorgeous weather disappears, the grey clouds gather and a deluge of rain descends from the heavens. Blinking typical. But I am ever the optimist and I’m sure the days of balmy sunshine will return to us soon. 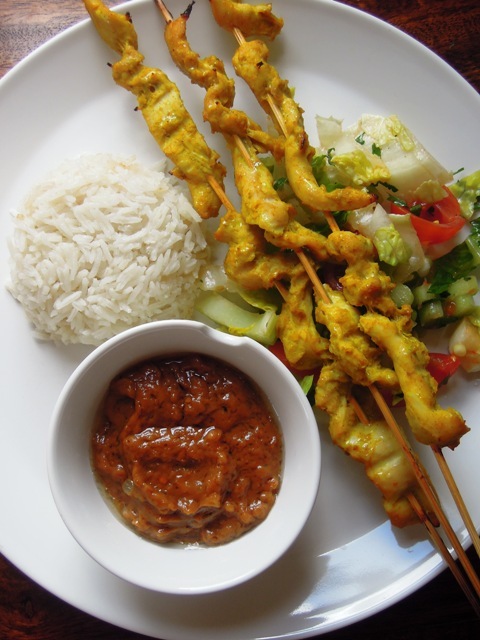 And this chicken satay is a dish we’ll making again on the barbie. This was one of my favourite dishes when I went to Malaysia and Singapore as a child to stay with my Mum’s family. I thought the hawker stalls were just so exciting and loved the way the sticky rice came wrapped up in banana leaves. I can’t clam my version is at all authentic I’m afraid, and it isn’t easy to come by banana leaves in the middle of Somerset. It is ruddy tasty though, and I could easily polish off a whole bowlful of that peanut sauce on its own. 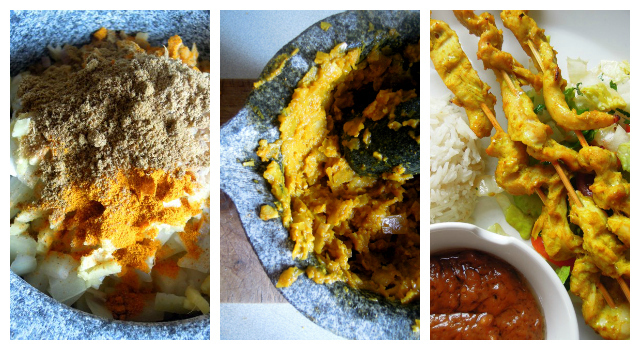 The chicken satay is packed full of spice and while it’s fine to mince the marinade ingredients in a food processor, I rather like doing it with a pestle and mortar to work out some of those pent-up tensions. It’s best to marinate the chicken overnight or at least for three to four hours. Crush together the onion, garlic, lemongrass and ground spices using a pestle and mortar (or in a food processor) to create a rough paste. Add a little salt, sugar and pepper to taste. Stir in the fish sauce and chilli. Pour the paste onto to the chicken and mix well with your hands to thoroughly coat. Cover with cling film and leave to marinate in the fridge overnight, or at least three to four hours. Soak 16 bamboo skewers in water for around 30 minutes to stop them from burning on the barbecue later. Carefully thread the marinated chicken onto the skewers. Grill the chicken for about five minutes, turning frequently, until it has cooked through. Heat the oil in a saucepan and gently fry the onion, chilli and garlic for a few minutes until the onions are soft. Add the ground ginger and peanut butter giving it all a good stir until the peanut butter starts to melt down. It should start to melt. Then add the tamarind paste and soy sauce and stir again. Next goes in the coconut cream and water. Cook and keep stirring for a few more minutes until everything is well incorporated. 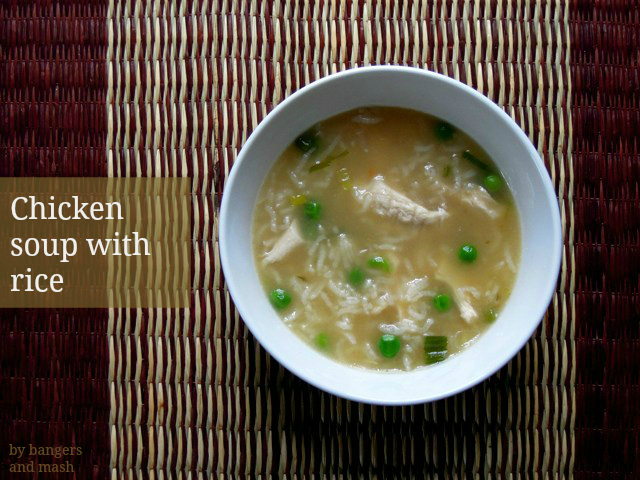 Pour the peanut sauce into a bowl and serve warm alongside the chicken and rice. Place the coconut milk, ground ginger, salt, bay leaf, lemongrass stalk, and rice in a medium saucepan over a medium heat. Stir together and cover with a lid. Bring to a simmer and reduce heat. Continue to simmer very gently for around 20 minutes, until the rice is tender and has absorbed all the coconut milk. If it dries out before the rice is done, add a little water. When it’s cooked, fish out the bay leaf and lemongrass stalk – you don’t want anyone chowing down on either of those. Serve the rice by packing it into a small, very lightly oiled bowl and turning it out onto a plate alongside the barbecued chicken satay and individual bowls of peanut sauce. I like to add a simple dressed salad to the plate too. Now that is properly finger-licking good. As the spice mix for the chicken satay features cumin, I am entering it into this month’s Spice Trail challenge, where of course the theme this month is cumin. 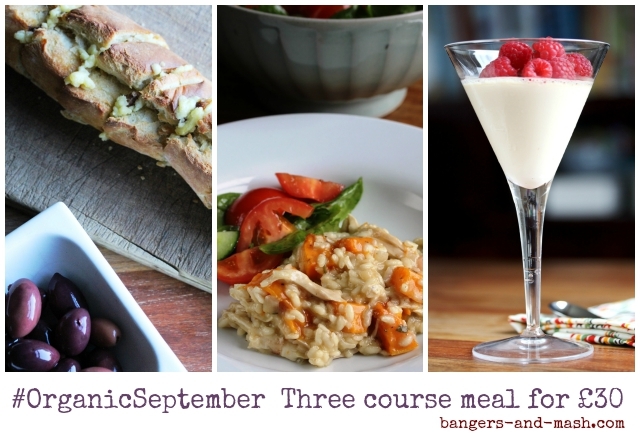 I’m also entering it into June’s Family Foodies, hosted this month by Louisa at Eat Your Veg. The theme is Barbecues, Picnics and Outdoor Eating and I think these chicken satay fit the bill perfectly. We all have times when we need to rustle up an easy dinner using basic, store cupboard ingredients. You’ve been up against it at work and haven’t had time to get to the shops. It’s the end of the month and money is tight. Whatever the reason, it’s useful to have a go-to dish or two up your sleeve. My usual store cupboard recipes tend to feature cheap ingredients like pasta, beans, pulses and whatever I find in the freezer. I make sure I always have a few bags of vegetables in the freezer for times like these. Frozen veg is just as good as the fresh stuff in certain dishes, and cheap as chips too. Rice makes a regular appearance too. I ate a lot of rice as a little girl. For a while my mother only worked part-time while she also studied for her MA, and there wasn’t a lot to spend on food. So rice became a staple, mainly due perhaps to my mum’s Chinese roots, quite often served with just soy sauce or, if we were lucky, some stir-fried vegetables on the side. You’d think that might put me off rice but instead it is one of my favourite foods. 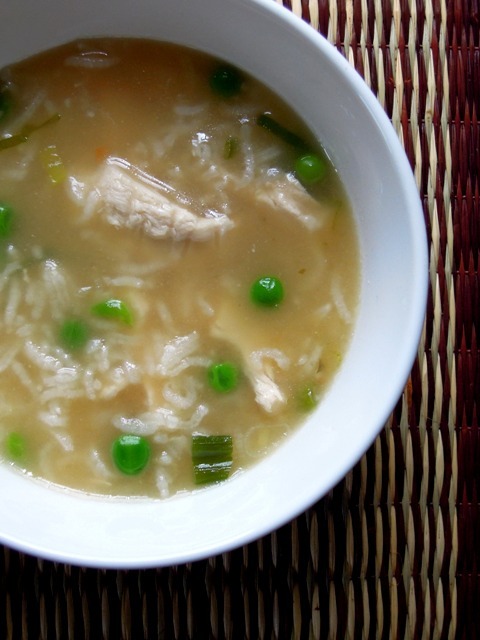 When I am feeling low or poorly, there’s nothing I appreciate more than a simple bowl of rice with soy sauce or perhaps some chicken stock to make a very simple rice broth. 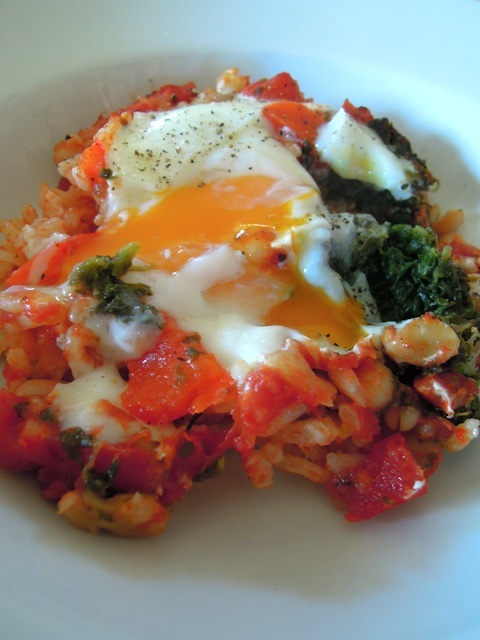 This baked rice recipe is ever so slightly more elaborate but a real winner when it comes to store cupboard cookery. 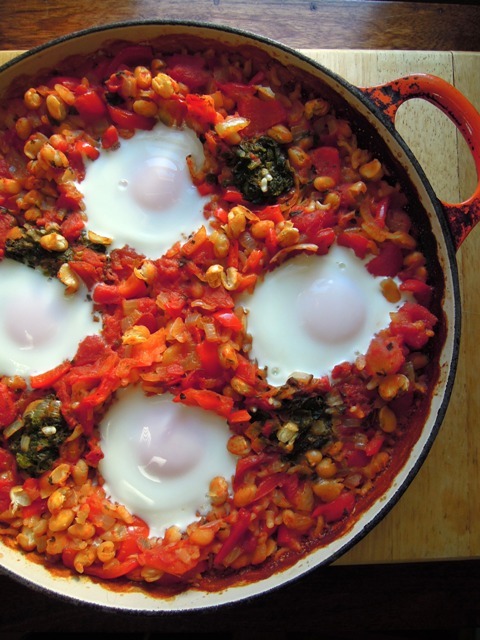 The addition of eggs turns it into a proper comfort dish.Anything topped by an egg with a runny yolk gets my vote. It’s a very versatile and forgiving dish too. That’s the whole point of store cupboard recipes. Instead of spinach, why not throw in a few handfuls of frozen peas or sweetcorn? Instead of cannellini beans, try kidney beans or maybe a tin of tuna. Heat the oil in a medium-sized heavy bottomed casserole and gently cook the onion until soft and translucent. Add the garlic and cook for a minute or two, before adding the rice. Stir it all together and cook gently for another minute. Pour in the chopped tomatoes, stock, cannellini beans and a little salt and pepper. Give it all a good stir and then place chunks of frozen spinach, nestling it in amongst the rice and beans. Cover the casserole with a lid and bake in the oven for 20 to 30 minutes until the rice is tender. Remove the lid and, using the back of spoon, make four slight dips in the rice. Break the eggs into these wells and return the oven for another five minutes or so, until the whites are cooked but the yolks are beautifully runny. 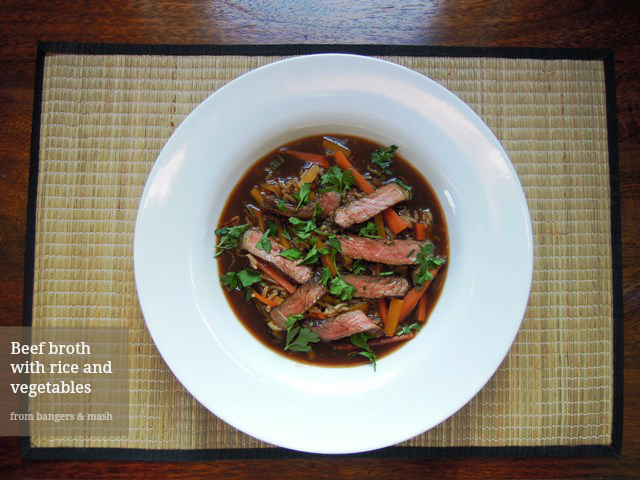 This recipe was first published in my Eat the Season column in the Wells Journal on 6 March 2014. As my baked rice is very easy to make and cooks in around half an hour, I’m entering it into this month’s Fab Fast Food challenge for Family Foodies, an event I run with Louisa at Eat Your Veg and it just happens to be my turn to host. I am also sharing this dish with Speedy Suppers, a new blog event for 30 minute meals launched by Sarah at Dinner With Crayons and Katie at Feeding Boys. I’m really rather excited about this new challenge – I just know it’s going to prove such a useful resource. When you read my blog posts, it’s probably easy to assume I spend most of my life in the kitchen. While it’s true that at the weekend I can generally be found at the stove and do make a bit more of an effort with our meals, most of my family’s food is a pretty speedy, simple affair. I am a working mum and most days I don’t have time to cook anything too complicated, so I am trying to build up a trusty list of staples I can rustle up in half an hour. I realise Jamie Oliver can cook up a meal in just 15 minutes but, unless it’s beans on toast or pesto from a jar stirred into pasta (and there is nothing wrong with either of those), I find it practically impossible to cook anything quite that quickly. Although that’s probably because, unlike Jamie, it’s impossible for me to give the dinner my undivided attention. There’s usually one of the children asking for help with their homework, or the cat demanding to be fed, or my husband wanting to know if I’ve seen his glasses/wallet/keys (delete as appropriate). You get the picture. This is one of those meals I can cook up in about 30 minutes. Baking fish in foil makes for an incredibly quick dinner and, by throwing in heaps of garlic, ginger and seasonings, it’s incredibly tasty too. 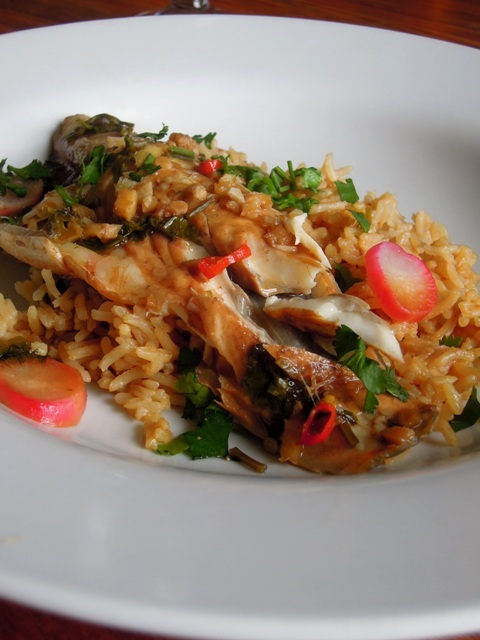 Sea bass is perfect with these strong Oriental flavours. What’s more, the foil parcels allow me to cater for different family tastes. My youngest daughter is only five and isn’t keen on chilli, so I wrap her fillet separately and leave out the chilli. My husband can’t actually eat fish, so I wrap a chicken breast instead for him, although I do have to cook it for an extra five minutes. Cooked in instant miso soup, the rice has a wonderfully savoury, umami flavour and I could happily eat bowlfuls of this rice on its own. Preheat oven to 220°C / gas mark 7. Tear off sheets of foil, large enough to encase your fillets. You can bake them altogether in one parcel or individually, depending on whether everyone is happy with all the ingredients – I’m thinking mainly about children and chillies here. Drizzle a little sesame oil onto the foil before placing the fish on it, skin side down. 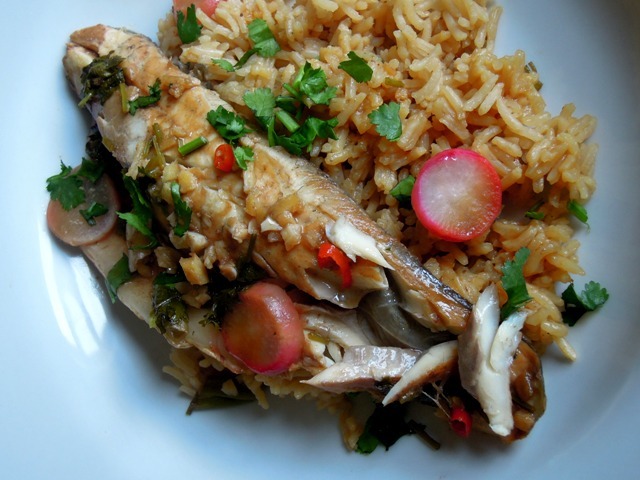 Pull up the sides of the foil around the fish and toss in the ginger, garlic, chilli, radish and spring onion. Pour in the fish sauce, lime juice, soy sauce and finally sprinkle with the fresh coriander. Close up the foil parcel tightly and place on a baking tray. Bake in the oven for 20 minutes. Cook your rice in your usual way, but instead of using plain water, make up a cup of miso soup according to the packet instructions, and cook the rice in this. Serve the fish on the rice and don’t forget to pour over all that lovely sauce left behind in the foil. Garnish with more chopped coriander. 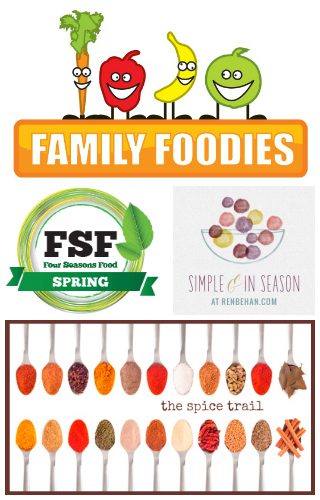 Fab Fast Food is the theme for Family Foodies in March. 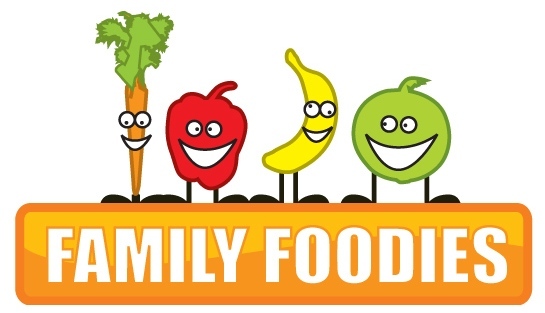 Family Foodies is a challenge I co-host with Louisa at Eat Your Veg and this month it is my turn to host. This baked sea bass is one of my favourites for a speedy supper, but I’m keen to see your ideas so I can have a few more tried-and-tested dishes up my sleeve. The theme for Four Seasons Food this month, hosted by Louisa at Eat Your Veg and Anneli at Delicieux, is Something Fishy, and so I’m entering my baked sea bass into that challenge too, and as sea bass is in season right now I’ve just got to enter it into Ren Behan‘s Simple and in Season food blog event. Finally, as this dish features a good amount of fresh ginger I’m also entering it into The Spice Trail, hosted by me, as the spice in question this month just happens to be ginger. Here’s my final frugal recipe offering for Save the Children and the Live Below the Line challenge, which will see thousands of people this week attempting to spend just £1 a day on food and drink – the equivalent to the extreme poverty line. My previous creations have been a Virgin Bloody Mary soup made from tinned tomatoes and red pepper, and Spicy Bean Burgers made from tinned kidney beans. Admittedly it might not look all that appetizing, but it is tasty and cheap and filling. And at less than 40p a portion, that’s no mean feat. 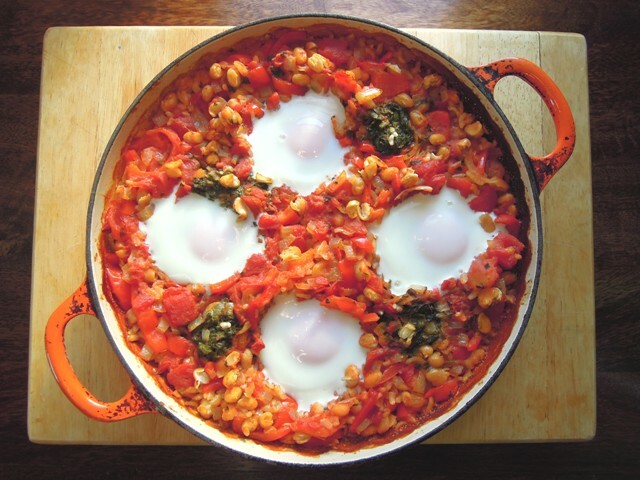 Also known as mujaddara, this is a peasant dish made from lentils and rice, popular across the Arab world. It’s supposed to be made with brown or green lentils. I made mine with red lentils, which is possibly why mine went a little mushy but my family weren’t to know and ate it without complaint for lunch today. Well, except Mia the youngest, who complains about everything the first time she tries it. She got into it two after a few mouthfuls. 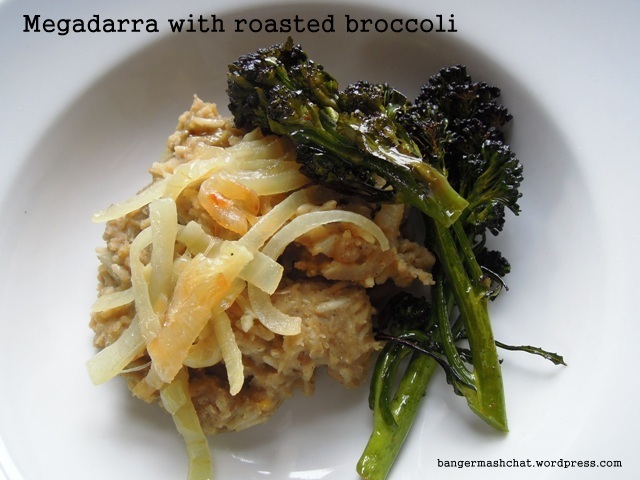 I was lucky enough to use fresh broccoli from our vegetable patch, but you’ll see I’ve costed frozen broccoli in the recipe below as this, I’ve discovered, is the cheapest way to buy vegetables. Put the lentils and stock in a large pan and bring to the boil. Simmer for around ten minutes before adding the rice and cumin. Simmer for another 15 to 20 minutes until the lentils and rice are cooked and the stock has been absorbed. You may need to add a little more liquid if it starts to dry out before they are cooked. While the lentils and rice are cooking, you can get on with preparing the onions and the broccoli. Fry the onions in a tablespoonful of oil over a low heat. Cook gently for around half an hour until soft and golden. Add the crushed garlic and fry for another couple of minutes before removing from the heat. 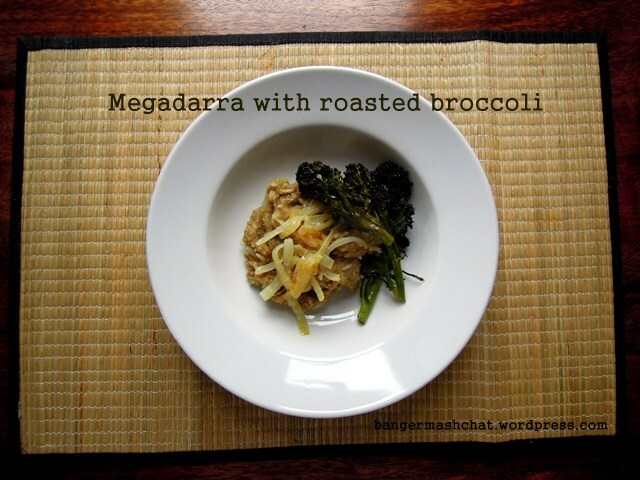 To roast the broccoli, place in an ovenproof dish and toss with a tablespoonful of oil and sprinkle with the chilli powder. Roast for around 25 minutes until just tender and darkening. To serve, stir two-thirds of the onions into the lentils and rice, and serve in bowls with the rest of the onion and broccoli on top with some yoghurt on the side. Dig in! And as with all my Live Below the Line dishes, I’m entering this into April’s Credit Crunch Munch co-hosted by Helen from Fuss Free Flavours and Camilla from Fab Food 4 All. We’re at the end of the third week of the school summer holidays. Can you believe we’re already halfway through? And this week we have travelled, by virtue of our imaginations, to the idyllic island of Penang in Malaysia for the next of our Around the World in Six Suppers. Hainanese Chicken Rice is a dish I’ve been meaning to make for years. 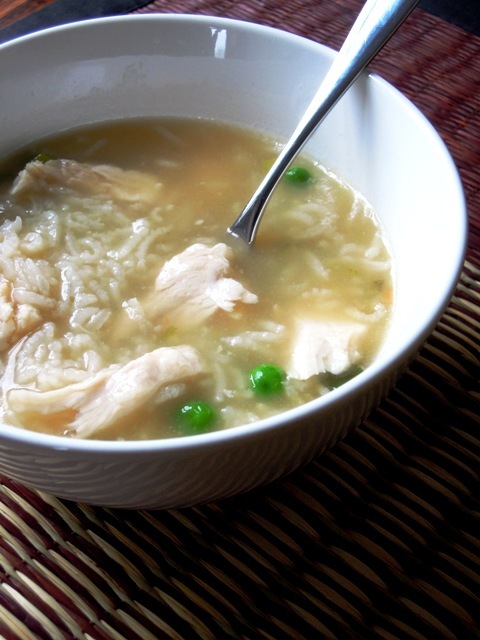 It’s a very simple poached chicken served with rice and chicken broth, which I remember devouring as a child during our holidays in Penang. Mum would take us down to the hawker stalls, away from the more touristy restaurants, and we would eat proper Chinese-Malaysian food with the locals. My Mum was born and grew up in Penang and would always refer to it as ‘home’. Whenever she talked about Penang, the stories would invariably touch on the food at some point! I haven’t been back to Penang since my early twenties, and hopefully I’ll be taking my own family back there next year. But in the meantime, we’ll have to make do with my favourite Penang meal. To make sure I got an authentic recipe, I turned to members of my Chinese-Malaysian family and my Auntie Lorene and Cousin Sisi came up trumps. Lorene now lives in America, while Sisi is in Australia – so you can see, we are a truly global family! So a big thank you to them for their help with the recipe and all the tips and advice. It’s a wonderful dish and it transported me straight back to the days of eating it as young girl in Penang, along with the smell of frangipani flowers and calomine lotion, being taught to use chopsticks, picking fresh rambutans and mangoes from the tree, being morbidly fascinated by dead snakes in jam jars, falling off to sleep at night to the comforting whirring of the ceiling fan, and running away from my Mum, her sisters and cousins as they gourged themselves silly on stinky durian fruit sold by the hot, sticky roadside. Start by giving your chicken a really thorough scrub with coarse sea salt or kosher salt. Rub hard to get rid of all the yucky stuff on the skin of the chicken to give you a good clear broth later on. Don’t rush this job. A little effort now makes all the difference later on. Once you’ve finished scrubbing, give the chicken a good rinse with cold water. Bring a large pan of water to the boil. Rub the chicken inside and out with salt. Insert into the cavity the spring onions, bashed garlic and ginger, and carefully place the chicken breast-side down into the water. Bring the water back to the boil, skim off any foam while cooking, and turn off the heat. Let the chicken sit in the pot, covered, for around 40 minutes. To check if it’s cooked, poke the thigh with a skewer or fork. 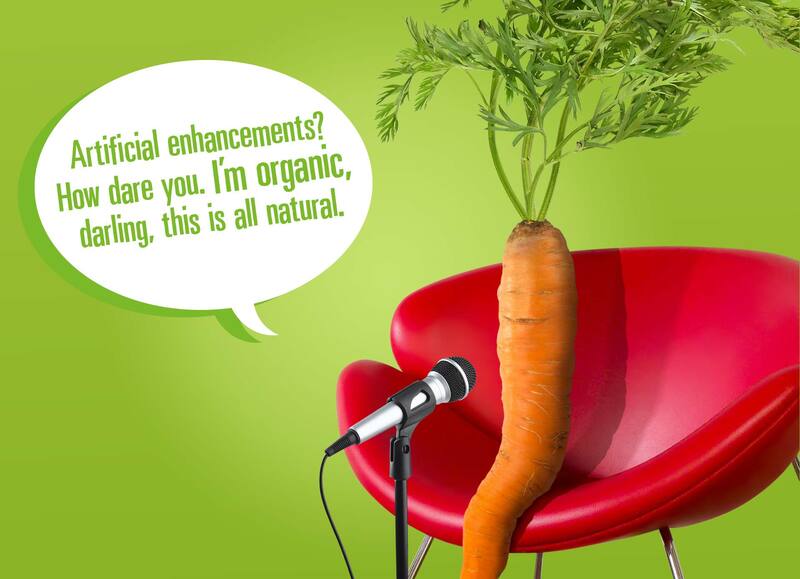 If the juices run clear, it is done. If not, leave for another five to ten minutes. When the chicken is cooked, remove it from the pan and place in iced water to tighten the skin. Reserve the stock for cooking the rice and for the soup to accompany the meal. Rub a couple of tablespoons of sesame oil into the skin, before chopping through the bone into serving pieces. In a large pan, heat the vegetable oil and a tablespoon of sesame oil over a medium heat. Fry the shallots, garlic and ginger until fragrant. Add the rice and stir until lightly toasted and the oil has been absorbed. Pour in a litre of chicken stock and season with salt to taste. Bring to a boil, cover and reduce the heat to low. 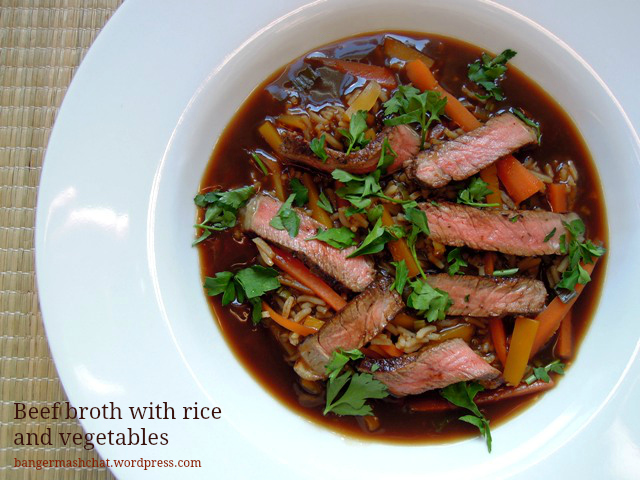 Simmer until the rice is tender – about 20 minutes. Heat the remainder of the stock for your soup, seasoning with salt and pepper to taste and sprinkling with chopped spring onions. To serve, arrange the chicken on a serving platter, and garnish with fresh coriander, spring onions, cucumber and tomato – although Sisi says her son and husband hate coriander, so she leaves it out! 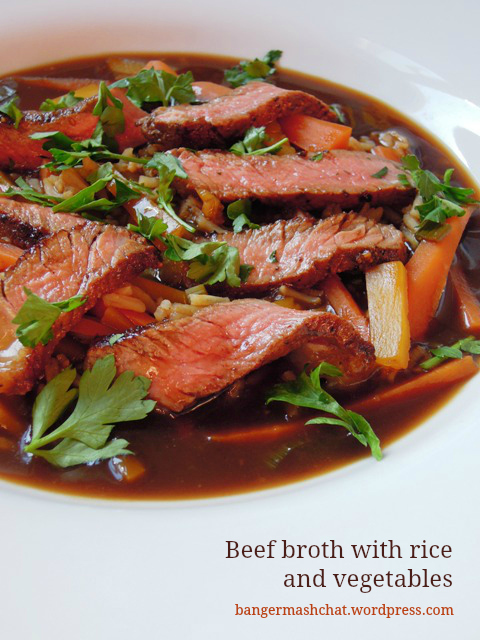 Serve with the rice and soup, and small bowls of soy and chilli sauce. As this is another wonderful family recipe, I’m entering it into TACT’s Care to Cook family recipe challenge – which aims to raise awareness of this amazing fostering and adoption charity working with some of the UK’s most vulnerable children and young people.